Lanterns are more than just objects that illuminate the spaces around us. Lanterns are used for celebration in times of joy and happiness. Lanterns are also a symbol to honor the memory of and help heal the loss of a loved one. In addition to their more sentimental meanings, lanterns are often used for decorating homes, weddings & outdoor living spaces. There are a variety of creative ways to brighten your life with lanterns, we've placed a few of our favorite ideas below. Home Decor - Place different sized lanterns on your mantle or inside a clean fireplace for an elegant look. Open the lantern door and add a coastal touch by placing delicate sand, seashells, and starfish inside. Place decorative ornament spheres and the first letter of your last name for personalized home decor. For holidays you can use colored sand, gemstones, flowers or pebbles in the lanterns with other decorations. During Christmas, fill up the lanterns halfway with colorful tree ornaments for a centerpiece, on your mantle or by your front door. Outdoor Decor - Decorate your front porch with lanterns by hanging them off hooks and place larger, different sized lanterns by your front door with flower pots or greenery. 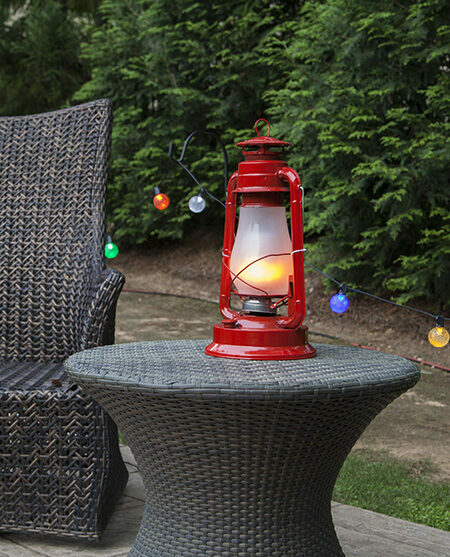 Dress up your outdoor furniture by placing lanterns on your tables. Lanterns can be hung on shepherds hooks or stands and placed down a walkway, in a garden or beside a patio. Weddings/Showers - Line walkways with beautiful lanterns to provide a guided pathway for parties. Use lanterns as centerpieces at events with flowers and petals. Hang lanterns from the ceiling with greenery and string lights for a decorative touch. Patios/Gazebos - Use lanterns for natural and calming light on your patio or gazebo. You can hang them with rope or simply place them on a table for a comforting glow. Camping/RV - Light your campsite with LED lanterns. Use bright lanterns to guide you through the woods or hang them from your tent. We recommend using the LED Hurricane Lantern because it has the power to be an intense source of light and can also be dimmed to your preference. It is not only battery operated, it is also extremely safe and kid friendly! Memorials - Have friends and family light candles in lanterns in honor of the loss of a loved one. 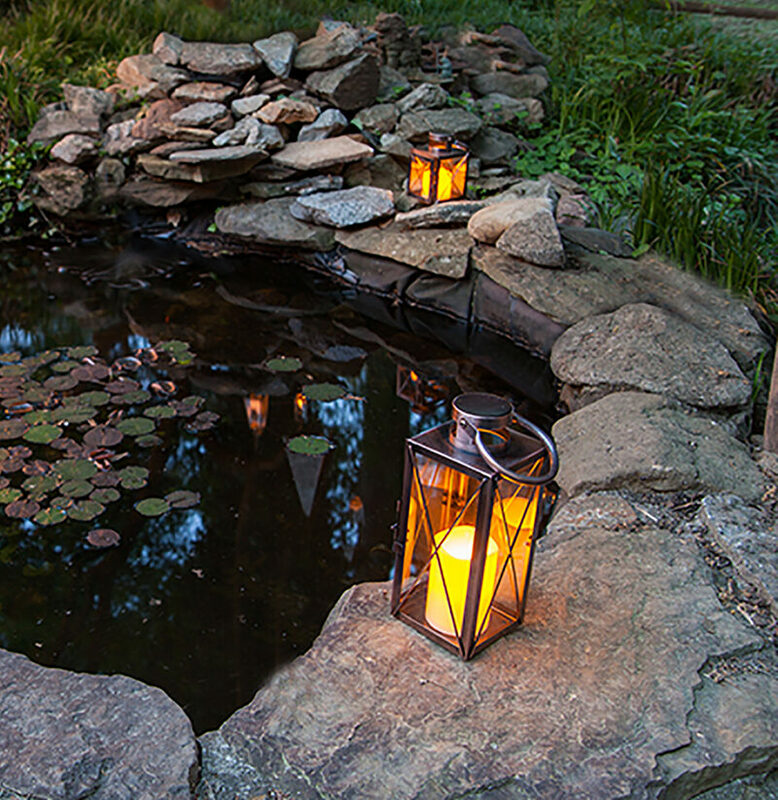 Line a park, bridge, or garden walk with calming lanterns for a memorial service. Boats - Create a relaxing oasis on your boat with battery operated lanterns and nautical decor. A Brief History of Lanterns: The Future is Bright! Lanterns were first mentioned in documents written in Ancient Greece, Egypt and China. In addition to being a functional tool, ancient civilizations also used lanterns during rituals and in times of celebration. The lantern structure was made out of paper, silk, animal hide, wood, and bamboo. The lanterns would then be lit using a candle or with a wick placed in fuel. This was definitely not a safe practice, but it was the only option for the time and as a result, ancient lanterns had an extremely high risk of causing fires. In addition to being highly flammable, the fuel used to power the lanterns was severely toxic and could cause carbon monoxide poisoning if it was lit in an enclosed area. Fortunately, these ancient lanterns were replaced by much safer metal and glass structures which were the most popular lanterns until the 1700s when electric light gained in popularity. Ever since, lanterns have continued evolving to be more efficient, safe, and intricate in their design. You can now find lanterns that are powered by batteries, electricity and even the sun! These new lanterns may not have a live flame inside, but they can still provide the illusion of dancing firelight. Take a look at our descriptions of some of these amazing new lanterns below to decide which option is right for your purpose and decorative preference. The Digital Flame LED Lantern is one of our most popular lantern styles. This unique lantern is includes a removable LED Flame bulb encased in a frosted glass chimney which produces a flickering effect that glows like fire. 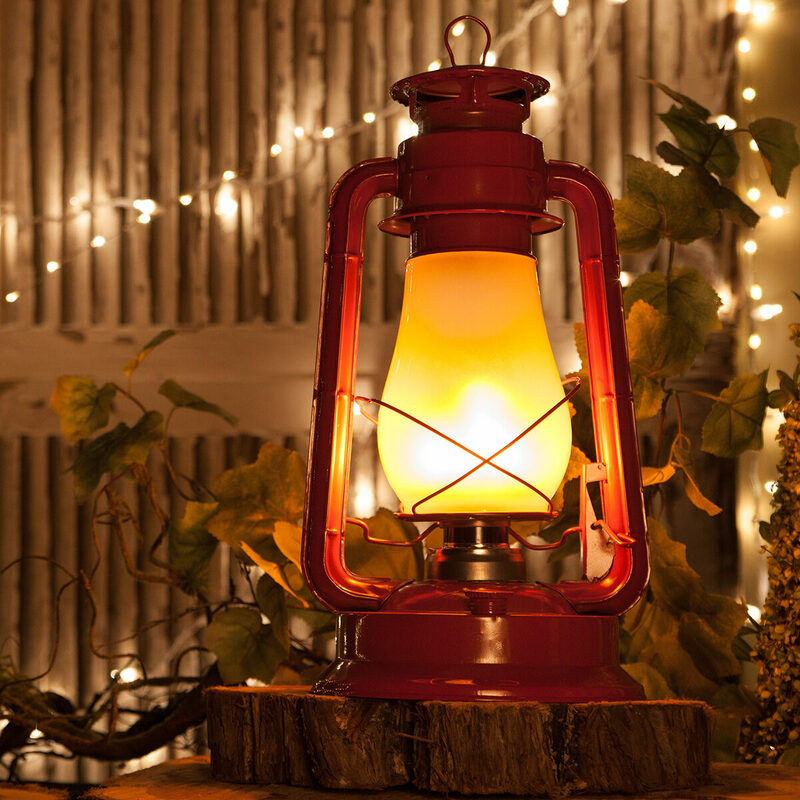 This authentic lantern is long lasting, requires no batteries, and is weather resistant. It is smoke, refill, and mess free, making it perfect for all events! LED Hurricane Lanterns are lit by 22 LED cool white dimmable bulbs. By having the dimmable option, you are able to adjust the brightness of the light to your preference. These camp style lanterns are safe and mess free. 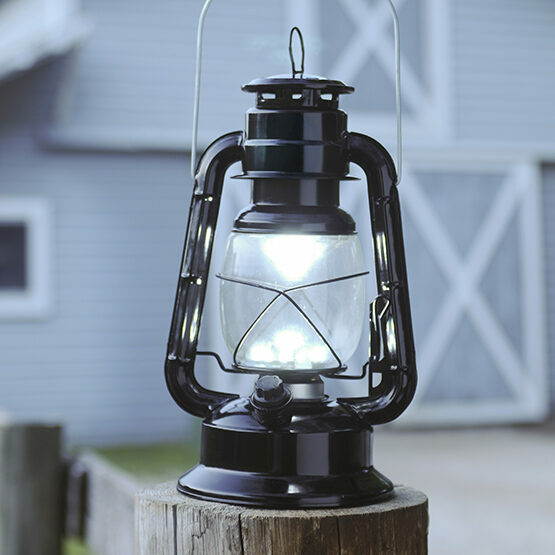 Keep one on the back patio or take it with you next time you go camping; this lantern is durable, incredibly bright & perfect for use anywhere you need light. 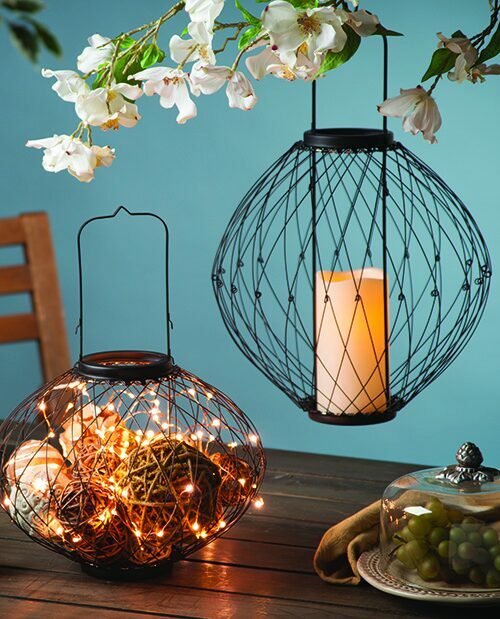 This expandable candle lantern is made with a sturdy, adjustable wire and can be transformed into either an oval, circle or cylinder. Place a candle inside or fill the lantern with battery operated fairy lights, flowers and various other decorative accents. These lanterns can be hung or placed as centerpieces in weddings, lining walkways, on mantles, and much more! Copper candle lanterns are a chic and elegant way to light up an event or outdoor living area. There are several different sizes of these lanterns and each comes with a lifelike warm white LED pillar candle. Add copper lanterns to your nautical themed patio decor to create warmth and ambiance in your oasis, or place one or a few on your mantle for simple decoration. This wooden candle holder is beautiful, rustic, and antique in its design. It comes with a lifelike taper candle inside and is perfect for easy hanging or just placing on a mantel or table. The top of the holder has a gorgeous design embedded onto the metal which pairs well with a rustic, vintage or bohemian theme.